The SMOK TFV12 PRINCE is a good-looking vape tank that is let down, rather spectacularly, by unreliable coil performance. SMOK’s mesh coils are slightly better but they still suffer from reliability issues. And this is just no good. Not at this stage in the game, anyway. For this reason, I DO NOT recommend it. On top of this, SMOK is competing with some truly excellent mesh coil vape tanks. 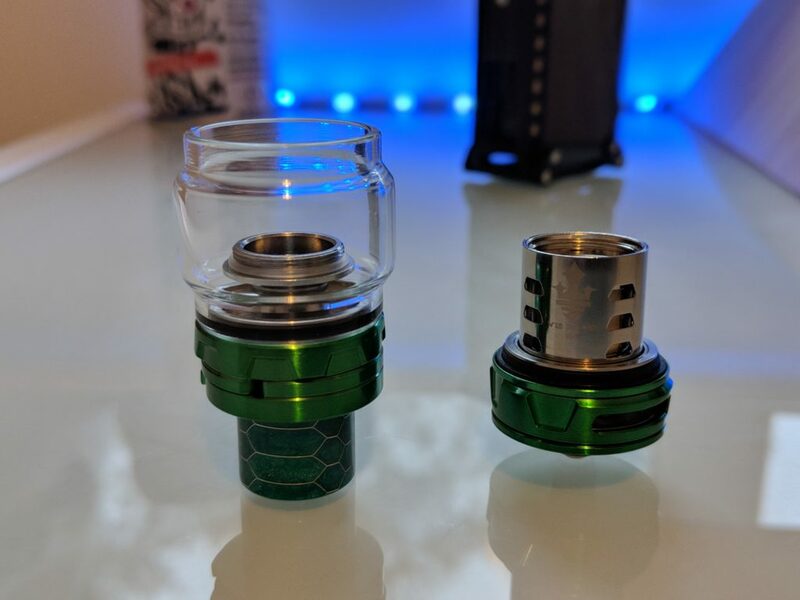 The Sense Screen Tank and the Falcon King Tank are both cheaper and infinitely better options than the TFV12. For this reason, I’d go with one of them over the SMOK TFV12 any day of the week. Right now, I’d say the Falcon King is my preferred vape tank right now. It looks immense and its coils are utterly spectacular, lasting weeks at a time. For me, it is currently the benchmark by which all other vape tanks are currently measured by. The Sense Screen would be a close second. 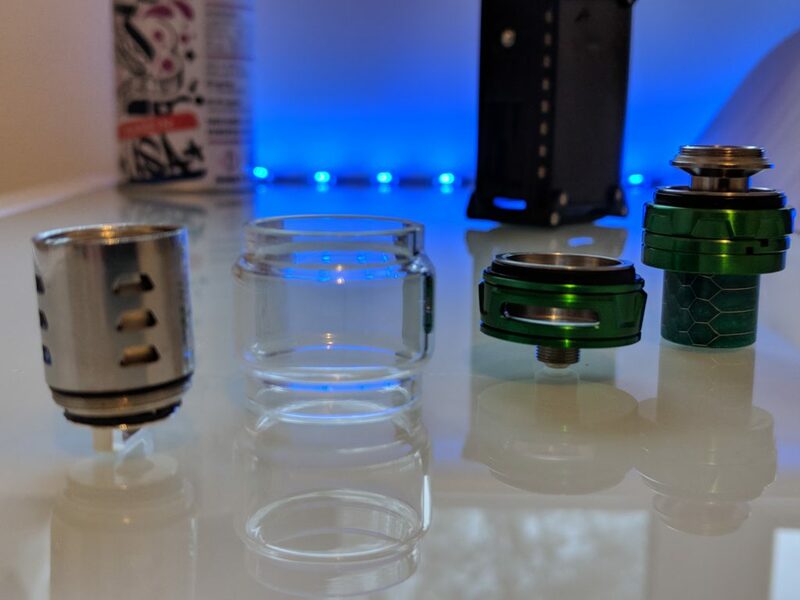 The EPIC Falcon King Tank – Zero Leaks & RDA-Grade Flavor on Tap! The SMOK TFV12 Prince is the latest (and greatest?) sub-ohm tank from SMOK’s skunkworks. The tank features a brand new design, a new coil system, and a new drip-tip system. Basically, it has been redesigned from the ground-up. But is it any good? I just spent a month testing out the SMOK TFV12 Prince. 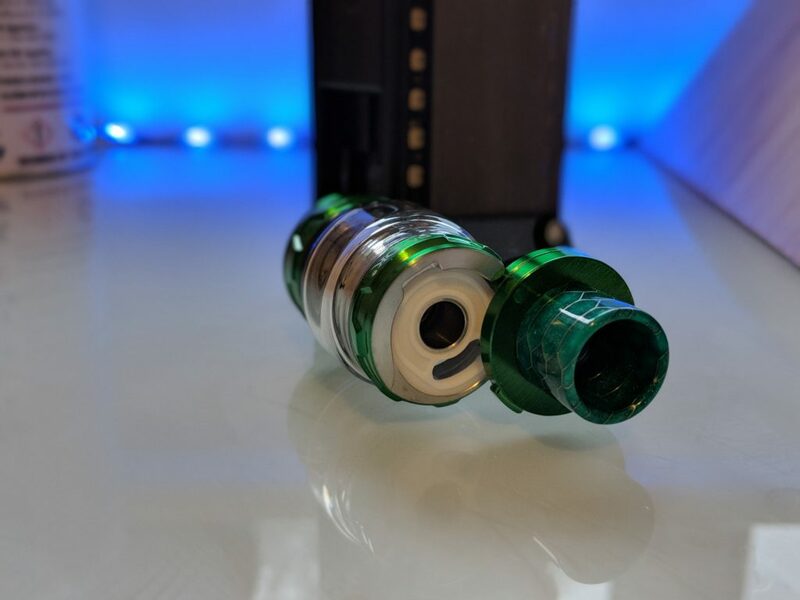 I took it everywhere with me, vaped on it all day long, got myself familiar with its coil system, and rocked it atop many a different mod in a bid to build the clearest picture possible about whether or not this tank is worth your time and money. 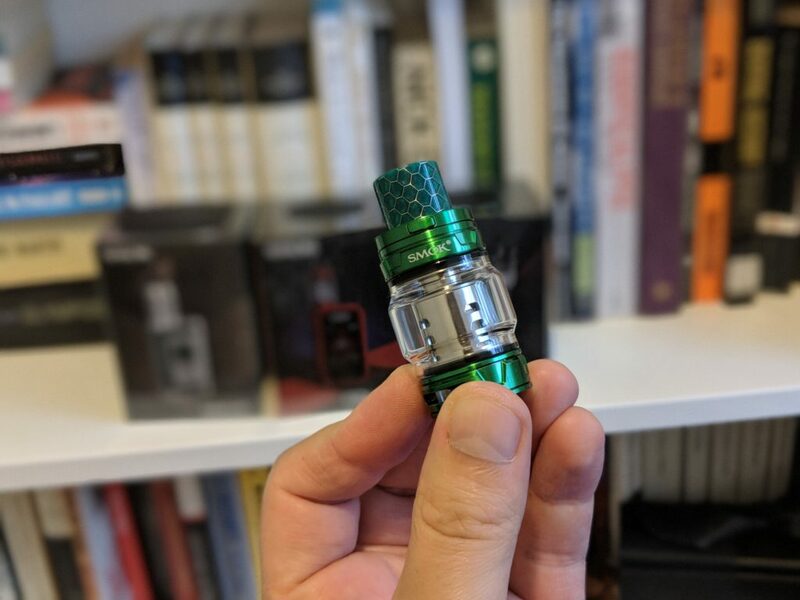 If you don’t know about SMOK’s line of TFV tanks, I will say this: they’re kinda like the iPhone of the sub-ohm tank space – immensely popular and used by A LOT of people. I have something of a love/hate relationship with sub-ohm tanks, however, and SMOK’s are no exception. Normally, if you saw me around, I’d be rocking an RDA or an RDTA. And the reason for this is that I HATE pre-made coils (but more on that later). After a month with the Prince, am I impressed? Is the SMOK TFV12 Prince the best sub-ohm tank you can buy right now? Let’s get stuck into this review and find out, shall we? The SMOK TFV12 Packaging. Nicely Done, SMOK! The SMOK TFV12 Prince feels very well put together; everything slips into place and comes apart very easily. I do really like the new design, the new convex glass tube means it can hold more E Juice. Plus, as a side benefit, it makes it look really unique. 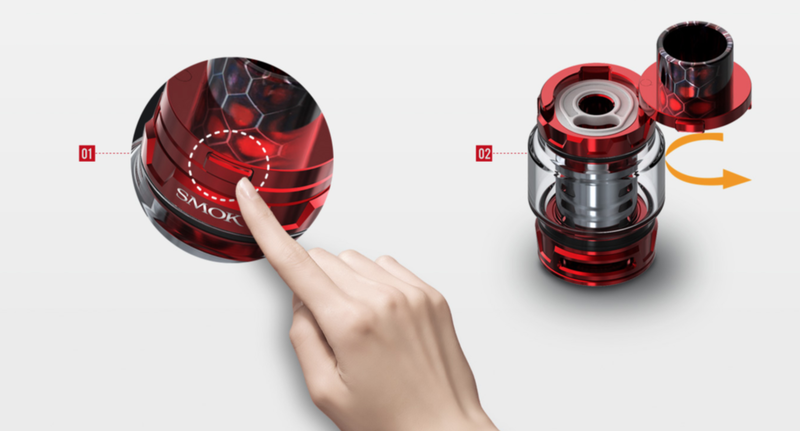 The main thing about the SMOK TFV12 PRINCE, though, is the design – it looks completely different to what came before, especially the convex glass tube, showing SMOK still has plenty of ideas when it comes to upping its game. You can, however, switch out the convex tube for a standard 5ml one if convex isn’t really your style. 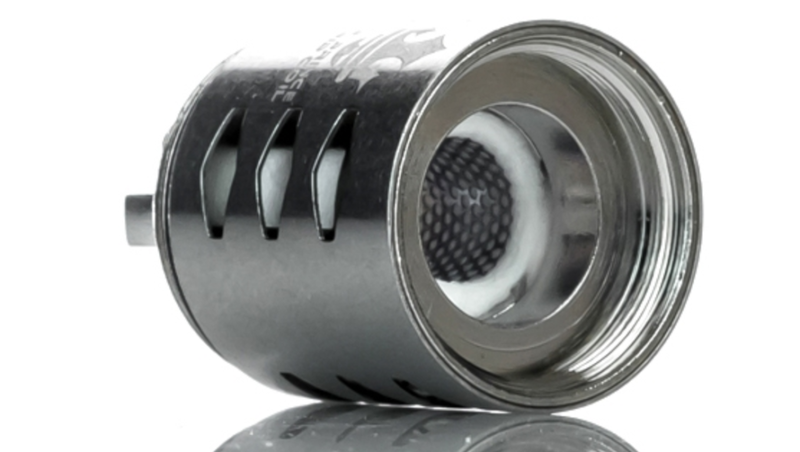 The big upshot of the convex design, though, is that it will increase the juice capacity to 8ml. You can also pick up a selection of Cobra Drip Tips for the SMOK TFV12 PRINCE. There are six options available and they all feature a pretty nifty design. My personal favorite is the Red option. SMOK has also changed the top-lock mechanism too; it’s now operated via a simple, clicky button. This means easier access, better locking, and less mess. SMOK says this tank WILL NOT leak. EVER. 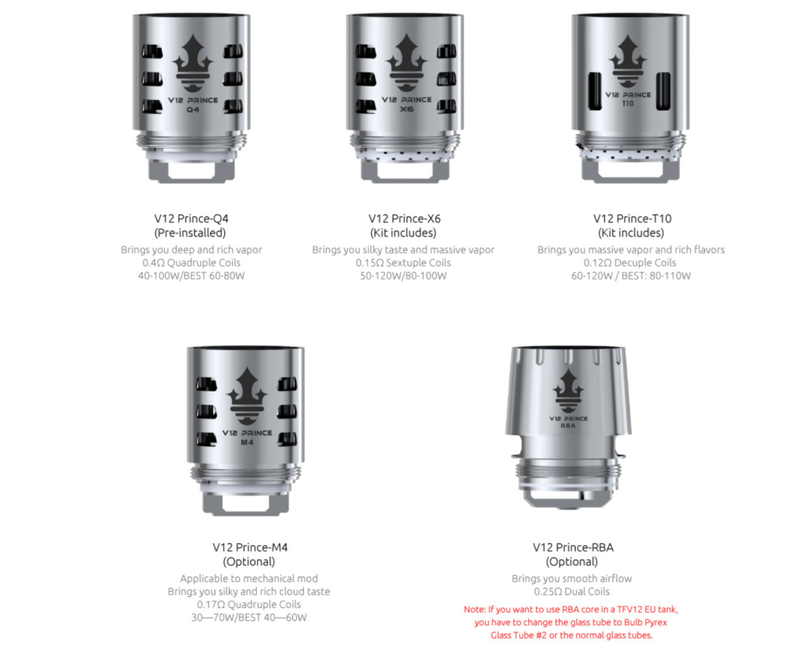 And like the TFV8 and TFV12 before it, the SMOK TFV12 PRINCE comes with full RBA capabilities, meaning you can build your own coils with the tank, which is great for those that like to build coils. It also reduces the amount you’ll spend on coils as well. So what’s new with the SMOK TFV12 Prince? Quite a bit as it goes, including a new design for the chassis and a new coil model called the V12 Prince-T10 Decuple Coil Head. The SMOK TFV12 Prince is designed to take what made the SMOK TFV12 great and add in MORE – more flavor, more performance, more clouds, more power. The coils, as usual, are big, metallic chunks of potential. They come in a variety of flavors, and there is also support for an RBA, though I didn’t get one with my review unit, so I cannot comment on this. Overall, my experience with the SMOK TFV12 Prince’s coils hasn’t exactly been great. Like 100% of pre-made sub-ohm coils in existence, performance is inconsistent at best which means you have bad ones and good ones. Get a good one, prime it properly using this guide, and you’re looking at BIG flavor, BIG clouds, and BIG performance. I have gotten a solid week from one coil and then, with exactly the same setup on another, less than 24 hours. 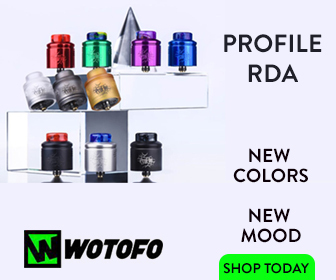 This is an issue for me, and the main reason I predominantly use RDA/RDTA tanks, as I just cannot put up with this kind of unpredictability – it’s just too costly in the long run. Mercifully, the SMOK TFV12 Prince does support an RBA-deck, so you can, should you want to, build your own coils and avoid this issue altogether. The thing that REALLY annoys me about this, however, is that when the SMOK TFV12 Prince’s coils are working as they should, they’re unbeatable for flavour and clouds. Nothing else comes close in the sub-ohm tank world. I just wish they could ensure a level of consistency across all models and batches. You’ve probably heard of mesh coils, right? You know, those new styles of coils that ALL good tanks seem to rock these days? Well, SMOK now has its own range of mesh coils for the TFV12 Prince, and they’re A LOT better than the normal ones. Just make sure you know how to prime mesh coils properly in order to get maximum performance. If you’re using this tank, or, like me, were using it but gave up after your coils packed up after about 10 minutes of use, it’s time to dust of the Prince and give him another shot. However, performance is still far too inconsistent for my tastes. The Falcon King and Sense Screen’s coils are far better in this regard. Bottomline: if you do get the SMOK TFV12 MAKE SURE you get the mesh coils (they’re $14.99 a pack). When the SMOK TFV12 Prince’s coils are playing ball, and they do 60% of the time, you’re in for a massive treat. This tank, like the TFV8 before it, kicks out immense flavor and clouds. It is also beautifully simple to live and work with. The design is a pleasure to behold and the coils, providing you follow our helpful tutorial, are really simple to prime. You won’t always get 100% performance from them, but this on account of production issues, not the tank itself – they just need better QC. When it’s all set up and running properly the SMOK TFV12 Prince is very hard to beat in the sub-ohm tank world. It vapes like a freakin’ monster and it kicks out ultra-precise, delicate flavors. The SMOK TFV12 Prince runs super cool as well, regardless of how hard you push it, and the ease with which it all comes apart means you can clean it really easily. The design aspect of the tank, from a physical perspective, is flawless. Yes, it’s big. But it looks dope on top of pretty much any mod you can think of. My only real criticism is the coils. I know how to prime them correctly, but even with focused attention on this aspect, you just cannot seem to avoid the odd dud batch and this, when you factor in the cost of coils, is not something you want to have to contend with on a regular basis. How bad is the margin of error? Impossible to say, really, but of the 10 or coils I tested, I would say about 5 of them were duds that burnt out after less than 24 hours. And this is just no good, in my book. When the coil gods are working with you, it vapes like nothing else. The coils are STILL inconsistent. The mesh ones are better, but still not as good as the competition. SMOK needs to work on its quality control. This is the only downside to this tank. 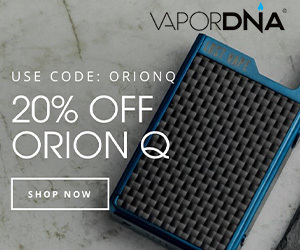 But please do not think this is a slight on SMOK, because it’s not – a lot of sub-ohm tanks suffer from this, so if you’re using sub-ohm tanks it is just a cost of business. 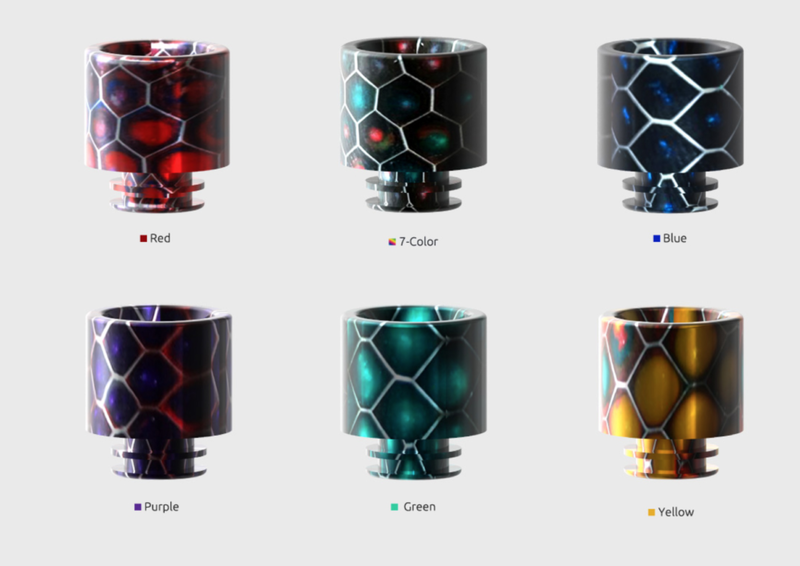 The TFV12 Prince is Available In Multiple Colors. Mine’s Green. That’s why it pays to use vape tanks that have long-lasting coils! When the Prince is playing ball, it’s great. The flavor is top-notch! Ditto cloud production. Maybe some of the best in the business, but you will stumble across the odd, dud batch from time to time. If you’re a sub-ohm tank user, you will know exactly what I’m talking about here, and I wouldn’t let this put you off getting the SMOK TFV12 Prince, as it is a phenomenal tank when everything falls into place. SMOK TFV12 Prince Review – Should You Buy This Tank? I wanted to love this vape tank. But for me, the coils are just too annoying to live with (and too pricey). And this creates a big problem when recommending this sub ohm tank. Especially when there are so many other really good vape tanks options around right now. On the one hand, it is brilliant – the flavor, the clouds, the design. All are very impressive. But inconsistent coil performance, far too often, swoops in and ruins everything. And this problem is further compounded when you consider other options that are available right now. Me personally? Sense Screen Tank over the SMOK TFV12 Prince every day of the week. And twice on a Sunday.